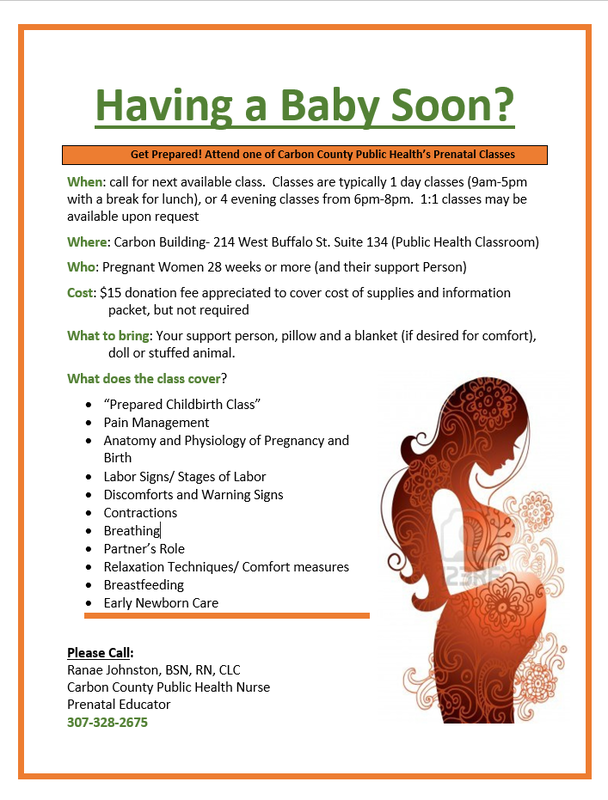 Carbon County Public Health is an organization that encourages a natural, healthy, and safe approach to pregnancy, childbirth, and postpartum care. Knowing that pregnancy and childbirth can be taxing on a woman’s body and mind, we serve as a resource for information about what to expect and what choices are available during the childbearing years. The Childbirth education and practices we teach are based on the most current medical evidence available. We hope to reduce the use of unnecessary interventions and improve overall outcomes for mothers and babies. $15 donation fee is appreciated to help cover costs of materials and information you get to take home, but is not required. Classes are typically offered every other month. Class types are typically 1 day classes (9am-5pm with a break for lunch), or 4 evening classes from 6pm-8pm. 1:1 classes may be available upon request. Call for the next available class. The next class will be: TBD- Please call to get your name on the list and a class will be scheduled when there are enough people signed up. Please feel free to call to get signed up for the next class, or request a 1:1 class! Call Ranae Johnston, RN, BSN, CLC (307) 328-2675 for more information or to register today! Please bring a pillow, blanket, something to drink and a partner! Anybody who took (or who is thinking of taking) a Birthing or Lamaze class through Carbon County Public Health, please help us out and take this survey. We are trying to ensure we are meeting the needs of our community. Survey Results so far show a preference for 4 day evening classes and some preference for a 1 day class. We greatly appreciate your input. If you have any questions regarding Birthing classes feel free to contact me (Ranae Johnston, RN) M-F from 8-5 at 307-328-2675.